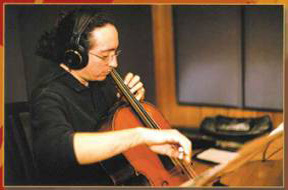 Cellist, flautist, arranger and composer, born in Fortaleza, graduated in Cello at the University of Brasilia/UnB and got a Masters at the University of Rio de Janeiro/UNIRIO. Acting musician, he has got a broad experience, having participated in several groups and orchestras and recorded with myriad well-known artists, such as Geraldo Azevedo, Tete Espindola and Elomar. Apart from being a part of Alma Brasileira Trio, he teaches at the Escola de Música de Brasília (Music School of Brasilia) and is also a member of the Symphony Orchestra of National Theatre Claudio Santoro in the Federal District, Elomar's (camerata) and Elba Ramalho's band.